​How could the army have gotten it so very wrong? Preliminary genetic analysis from random samplings of generationally wild, free roaming horses at Fort Polk in Louisiana confirm heavy Spanish association. While variables weigh into genetic testing results, the Fort Polk horses consistently pair with Puerto Rican Paso and Venezuelan Criollo , based on the preliminary genetic analysis by Dr. Gus Cothran, Ph.D. The phylogenetic tree chart below shows groupings of modern horse breeds, based on their similarities and differences in genetic and physical characteristics. Preserved in the remote Kisatchie Region for generations, the Fort Polk and Peason Ridge wild horses are Spanish type remnants of our country’s pre-colonial history. They have lived and bred in the wild, without dependency of man and largely remained undiluted from lines that contributed to other modern horse breeds shown on the phylogenetic chart. The Fort Polk Horses, Puerto Rican Paso & the Venezuelan Criollo share a common ancestral line. At some point the lineages split into distinct “lines” or breeds, but the root ancestry is most similar. The Fort Polk Horses clustered in this position indicate Spanish/Iberian lines. The fact that the Fort Polk Horses are clustered with aforementioned Iberian/Spanish breed types suggest that they could be considered more unique, especially given they exist wild in an area associated with Louisiana’s earliest pre-colonial history. Therefore, it would be prudent to stop and consider the permanent ramifications of any further horse captures and removals from the historical Kisatchie landscape. Spanish and North African Barb horses were brought from Iberian Peninsula and Canary Islands (Spain) by conquistadors to the Caribbean, Mexico and South American countries in the 16th and 17th centuries, with some historical info dating back as early as the 14th century. In the years that followed, explorers brought them to Florida, Mexico and Gulf of Mexico regions. Native Americans, such as; Comanche and others, acquired horses in the thousands in Texas from the Spanish and traded them north and west. Caddo, and Choctaw-Apache Native American tribes traded them eastward, across Louisiana to east of the Mississippi river. The expansion of these Colonial Spanish type horses that were free ranged on vast areas of un-fenced land led to the development of the Spanish Mustang horse. While Colonial Spanish type horses are not to be confused with the general term “Mustang“, (meaning a horse of unknown origin or owner-less beast), the mustang then spread across North America, before larger infusions of English bred horses that were not of Spanish origin, arrived on the east coast. The below map image shows explorer routes, Spanish origin horses across North America, a Spanish map overlaying the Kisatchie Region and Native American territories; before Native Americans were forced from their Kisatchie homelands hundreds of years ago. “Choctaw horses are descended from those brought to the United States in the 1500s and later by Spanish explorers and colonists, said Dr. D. Phillip Sponenberg of the Virginia-Maryland College of Veterinary Medicine. Along with the French and Spanish occupation, this is the Louisiana Purchase and Neutral Zone region. With settlement and colonization, it is where battles of the 18th and 19th centuries were fought and where Spanish horses drove herds of cattle to feed thousands of soldiers. This is also the region where wild cattle and wild horses were brought by the thousands from Texas to the markets in Natchitoches, Louisiana. In the WWII era, 60,000 troops trained with these hardy, compact horses that toiled alongside mules and regulation cavalry horses at Camp Polk, before it became Fort Polk in 1955. As the army acquires thousands more acres of land, it seemingly eliminates what it deems as “trespassing”. Instead of honoring these living cultural and historical treasures, does it seek to destroy the horses by removing them from their homes in the grasslands and piney woods of the Kisatchie region? Because the army has failed to execute a sustainable solution for these unique wild horses, (very few like them remain in the wild), Pegasus Equine Guardian Association and Louisiana citizens need to forge a campaign toward enforcing state and federal animal welfare laws, that specifically protect non-livestock, non-game animals, including wild horses in Louisiana. Emergency help is needed to establish protections. Wild, free roaming horses are commonly referred to as wild or feral (interchangeably). Because they have lived and bred in the wild, without man’s interference, neither are livestock because federal definitions of livestock specify livestock is domestically owned, bred and raised. Further, case law has established that wild horses in Louisiana and other states like New Mexico and others, (that are not managed under the Wild, Free Roaming Horses and Burros Act of 1971) are subject to state and federal animal welfare protections once rounded up. While there are protections for “Any Animal” in Louisiana, livestock is one excluded category. However, Louisiana’s livestock definition conflicts with the federal definition that is more specific. Louisiana definition needs to be overturned and changed to align with federal’s, so the applicable animal welfare laws to protect these non-livestock horses are enforced. Citizens must campaign for animal welfare protections for Louisiana’s wild horses; to remain on their homelands as well as if rounded up that they are not subject to rough or brutal handling by contractors, or rescues that allow such practices; nor should they be subject to neglect, withholding veterinary care, nor the inhumane ending of slaughter. 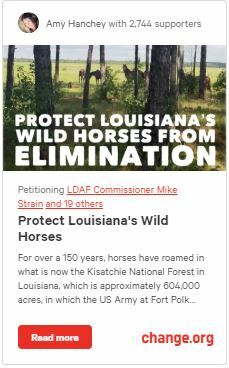 That’s what is needed before they are all rounded up, their hoof prints in Louisiana History vanish, and the chance to establish protections for the Fort Polk Horses of Kisatchie, a living Louisiana Treasure, is gone forever! In addition to the samples submitted to Dr Cothran, PEGA has also submitted a significant number of samples to Brooks Equine – University of Florida, which will be part of a larger study taking place in France . I don’t understand. If these horse are not causing a problem, why are you removing them? These horse may have a link to a much older breed, Why would you want to destroy that? That is something that needs to be preserved not destroyed. I don’t understand the deep need to destroy what does not fit in. This behavior could destroy what we haven’t found yet. Very sad!!! !